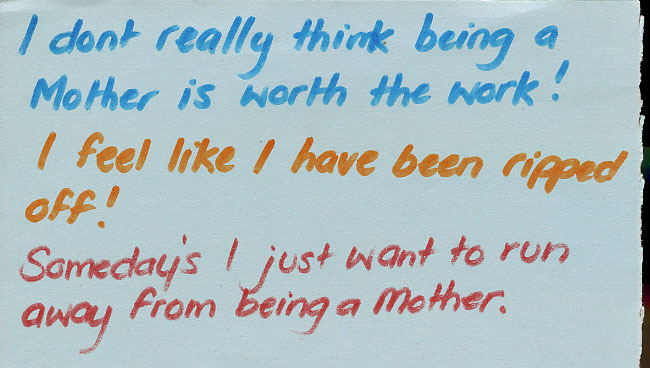 On Mother’s Day, PostSecret appropriately posted a number of mother related secrets. Here are my thoughts on one of them. We all saw Pretty in Pink and we know the more extreme stories: mothers who abandon their families, mothers who leave crying babies on doorsteps, mothers who abuse their children. We don’t talk about the less extreme, the mothers who tough it out but don’t really like it. For years, I’ve heard the whispers of these mothers on the internet. They quietly wonder why no one talks about the days when they wish someone would take their baby or child away. They reluctantly admit that they sometimes wonder what their lives would have been like if they had remained unencumbered and free. And how quickly they are condemned by those mothers who maybe didn’t want kids but whose entire lives were changed for the better once they did. 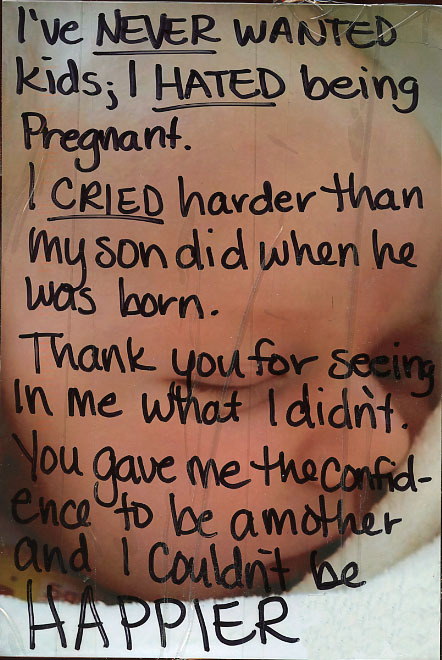 This is one of my fears: resenting my child. I don’t think I will suffer the way this mother suffers but I wonder what moments will arise, what moments of selfishness. How many times will I break down in tears because I won’t be able to get the baby to stop crying? How many nights out with my friends will I have to pass up? How many dreams will I have to finally pull the life support plug on? The movie Riding in Cars with Boys is a movie based on the memoir of Beverly D’Onofrio, the story of how she went from being a teenage mother in the ’60s to a successful editor and writer. Watching the movie, which has quite a few major differences from the book, I always felt a kinship with the Beverly character as played by Drew Barrymore. She was headstrong, creative, ambitious, and selfish. The mistakes she made were mistakes that I could see myself making. … it’s my fault. I’m what went wrong in your life. You know, you wrote a book about it. I want to make something clear. I don’t think I would’ve been better off without you. You are not what went wrong with anything. You were what saved me. I want to thank you for that. Okay? I’ve made a lot of mistakes in my life that have torpedoed any dreams I once may have had of what my life would look like. Any problems and failures in my life are my own fault. I don’t want to treat my Pipsqueak as my saviour (I already have one of those) but I don’t want to make the same mistake Beverly did. I hope my self-awareness is enough to protect us both from that urge. This is the happy ending we pray for. 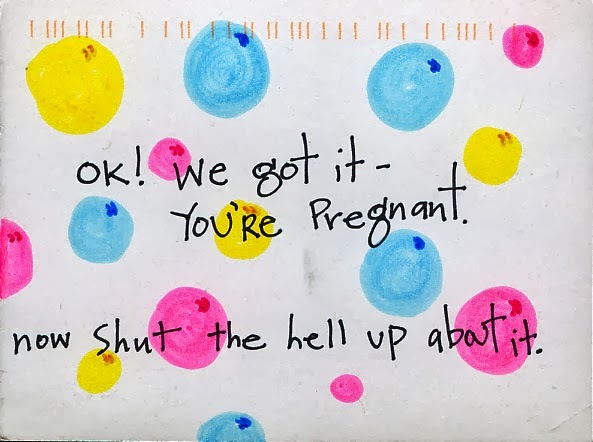 Courtesy of PostSecret’s Mother’s Day postcards.